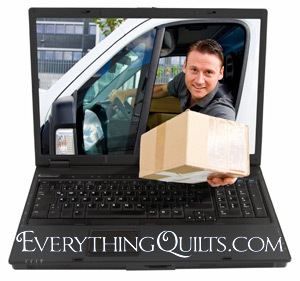 When you order with Everything Quilts, you are assured of quality service and products and prompt delivery. Orders are packed with care and delivered to your door! We will keep you informed with email updates on your order and including tracking information. Most orders ship within 1-3 business days. Orders are shipped with USPS Priority Mail, First Class Postal Mail or UPS or Fedex Ground for all orders within the domestic USA (no express shipping) and you will be emailed tracking information. Please note that orders delivered to Post Office Boxes, Military mail, HI, GA, AK, special orders, custom orders or excessive weight items which are shipped via USPS may be charged an additional fee if the shipping and handling charges incurred exceed our regular limits as we do not ship UPS Ground to these locations. All special orders, pre-orders, custom orders, and direct/drop shipped orders will be charged for any and all additional charges incurred. For example, an item that is over-sized (such as a 30 yard roll of batting or cabinet) may have additional shipping charges and will be noted that additional shipping will be applied for that item. Additional shipping charges may appear on your credit card statement as a separate charge. We may issue a merchandise credit coupon to use on your next order if shipping related costs are significantly less than estimated. We reserve the right to cancel and order for any reason and your payment will be refunded in full and we do not offer express shipping. Please verify that the information submitted for your billing and shipping address are correct. We are not responsible for mis-delivered orders if you have entered your address incorrectly, or if you are using a foreign charactor or translator to input the information. We highly recommend that you also enter your address again in the comments section of the order form or send us a separate email. We apologize for any inconvenience, but we are now shipping only within the USA. If you would like to purchase fabric from the USA, we would recommend that you visit www.equilter.com or www.fabric.com as they will be able to ship to your location. Thank you for your order and for choosing to shop at Everything Quilts!